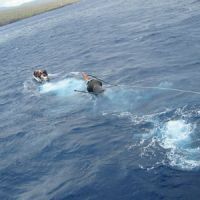 MOBY in the clear blue water at it’s mooring site off the island Lanai. 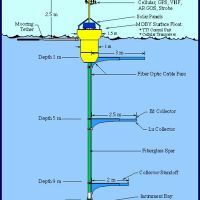 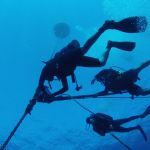 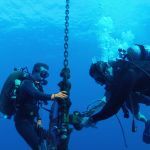 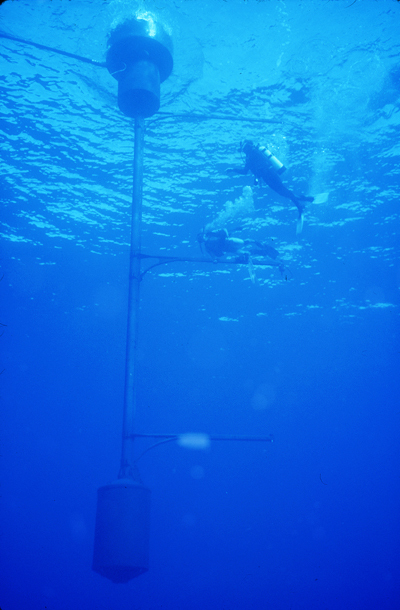 Diver’s are used to service the buoy and for the deployment and recovery of the buoy. 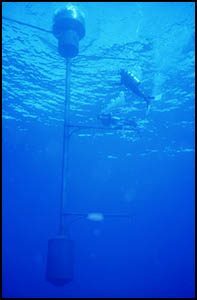 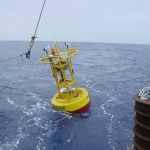 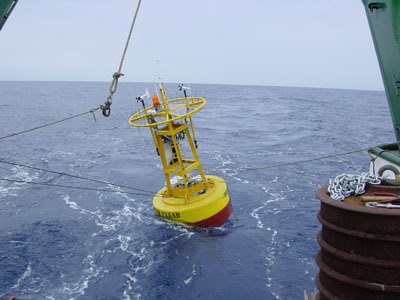 The Marine Optical Buoy (MOBY) is continuously moored 13 nm off the coast of Lania in 1200 meter of water. 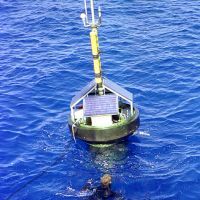 During prevailing trade wind conditions, this location is sheltered in the lee of the island, yet it is far enough offshore to minimize atmospheric perturbations associated with the island’s wake. 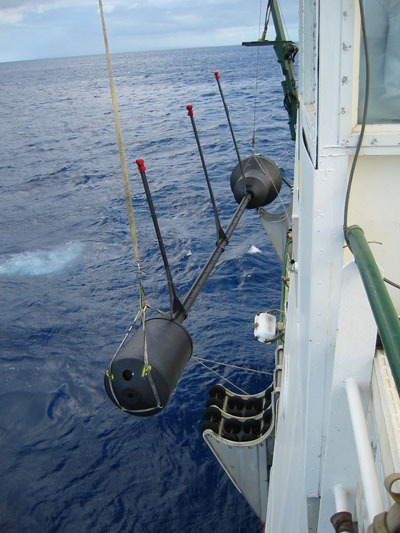 There are two complete MOBY systems, one of which is moored and operational at any given time. 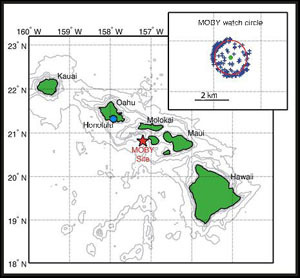 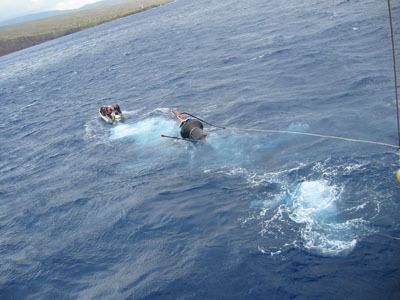 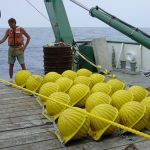 The typical duration of a single MOBY deployment is between three and four months. 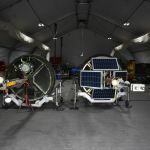 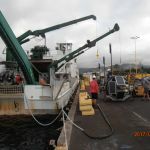 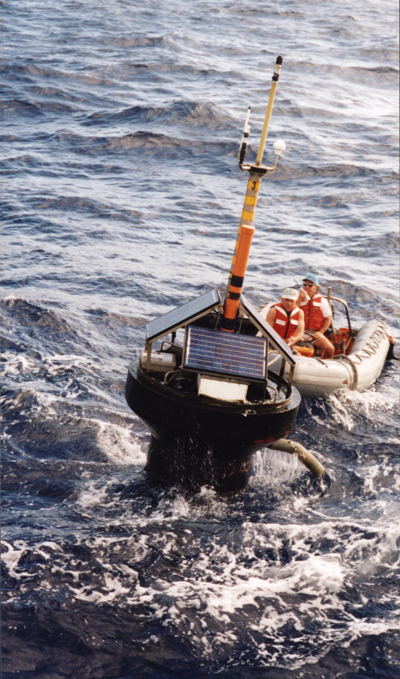 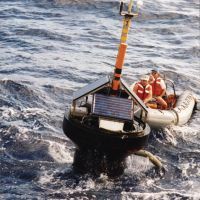 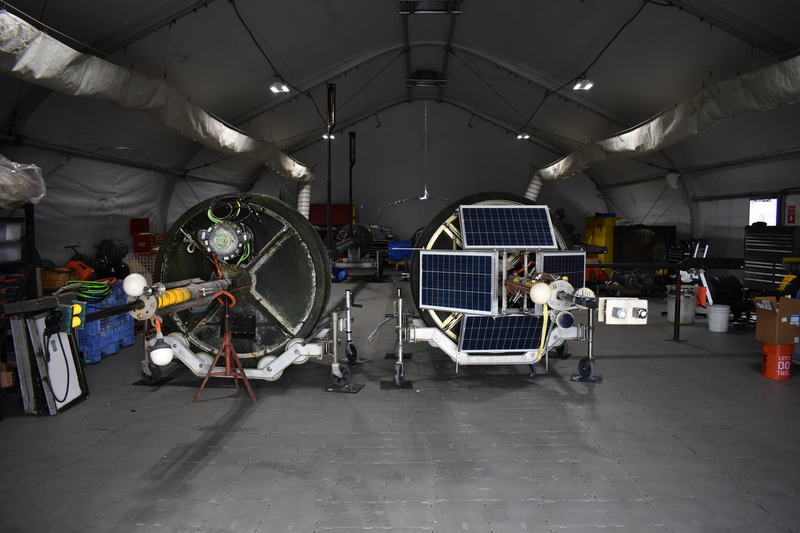 During this period, the other MOBY is maintained and refurbished, and its MOS recalibrated to prepare it for deployment in relief of its alternate. 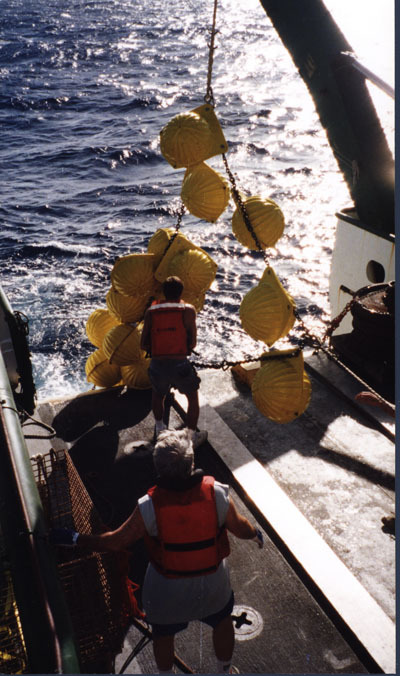 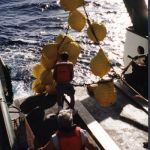 The following photos are of a typical MOBY deployment. 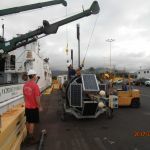 Two ship board cranes are required to deploy MOBY, as well as, a small boat. 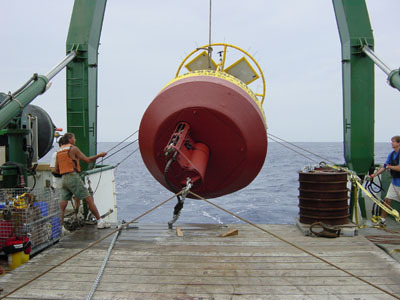 Which is used to move the buoy away from the ship once it is in the water. 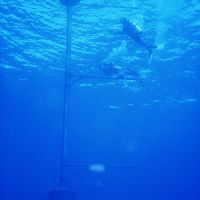 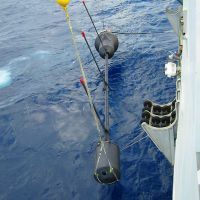 The crane simultaneously lifts both end of the buoy out of the cradles. 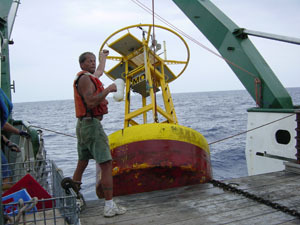 Tag lines are used to stabilize the buoy as it is lowered into the water. 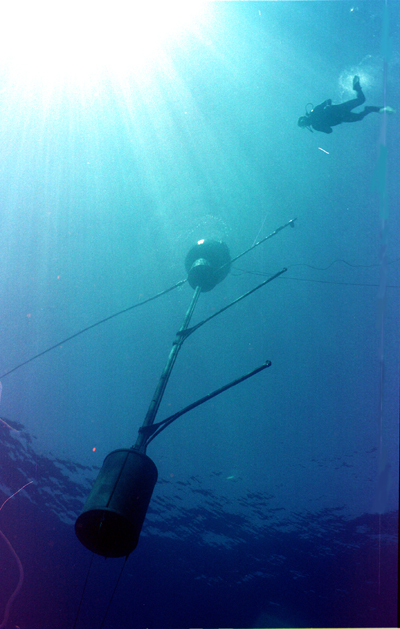 As the buoy nears the water the small boat begins to pull on the top of the buoy. 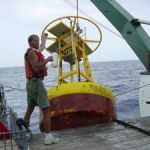 This helps keep the buoy from hitting the cradles as it is lowered into the water. 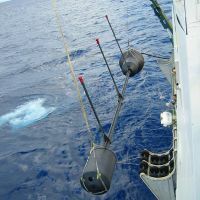 The small boat pulls more to continue to swing the top of the buoy away from the ship. 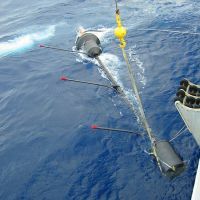 Once the top is in the water the quick release is pulled so the buoy is no longer attached to the crane and the small boat pulls the buoy away. 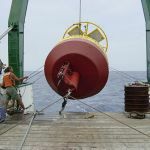 The second crane will be released once the top of the buoy is far enough out. 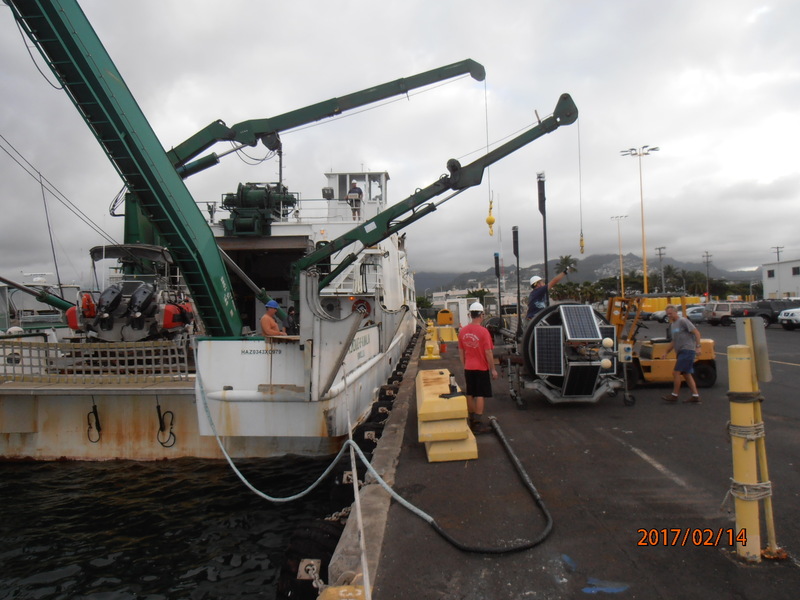 Both cranes are released and the small boat pulls the buoy away from the ship. 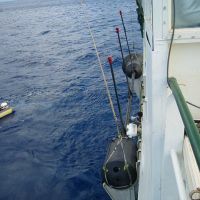 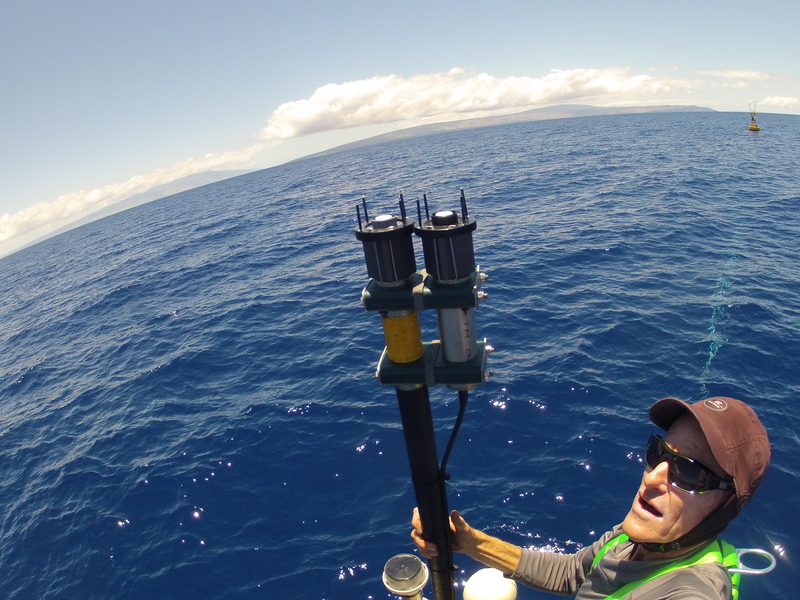 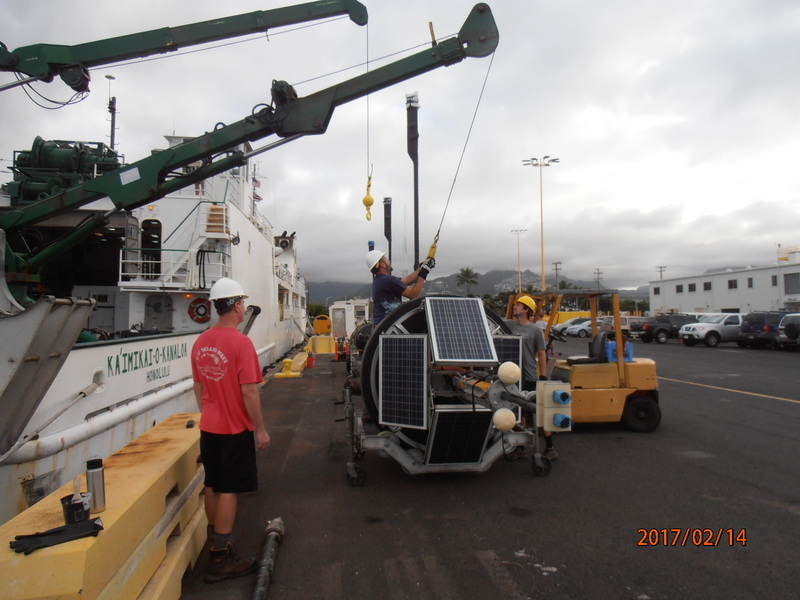 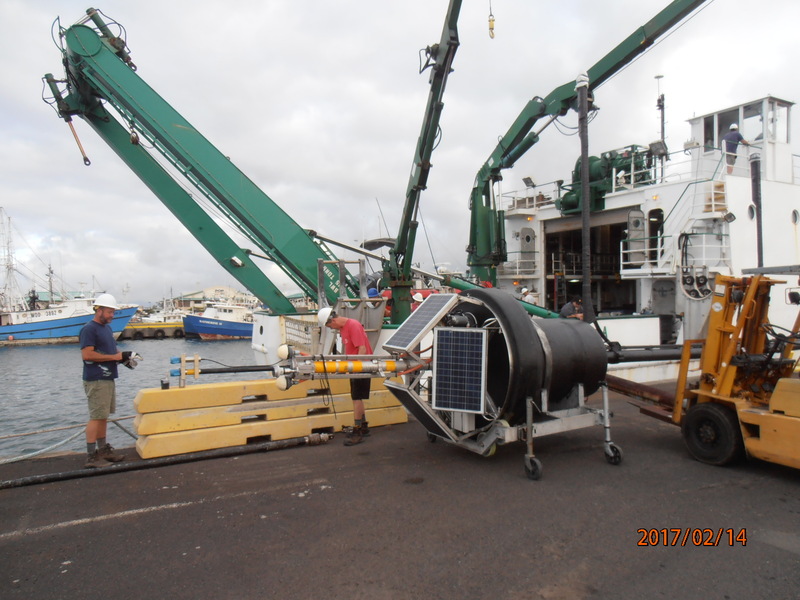 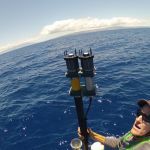 n this case the buoy was deployed in the lee of Lanai and will be towed by the R/V KA’IMIKAI – O – KANALOA to the mooring 13 nm off of Lanai. 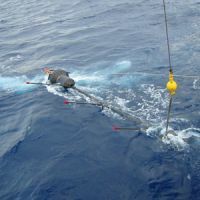 Normally it is preferred that MOBY is deployed at the mooring site. 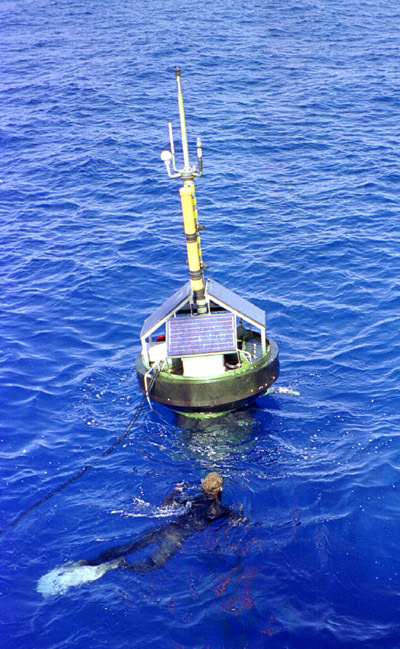 But in the case were the weather does not permit this, the buoy is deployed in the wind shadow of Lanai and towed to the mooring. 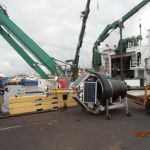 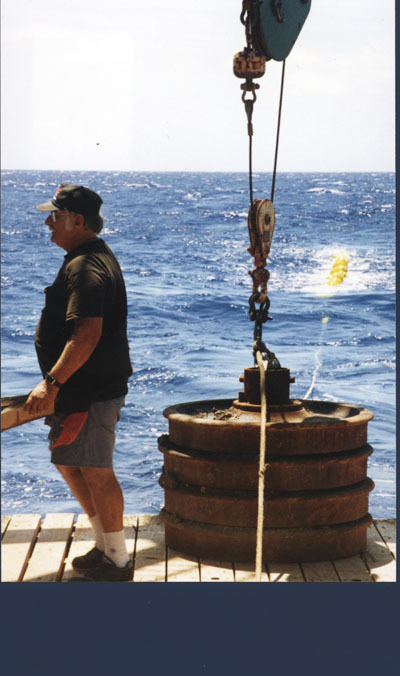 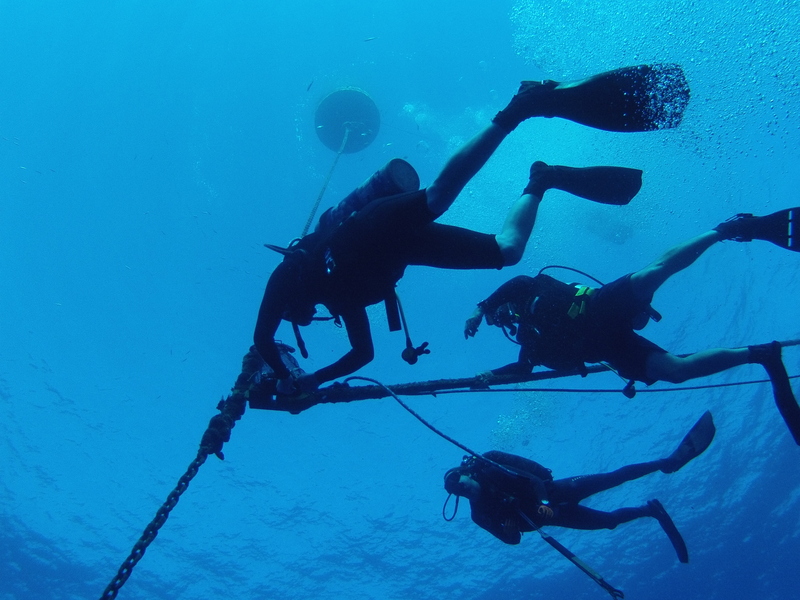 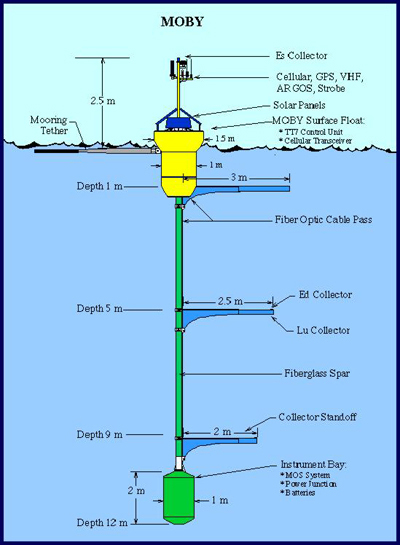 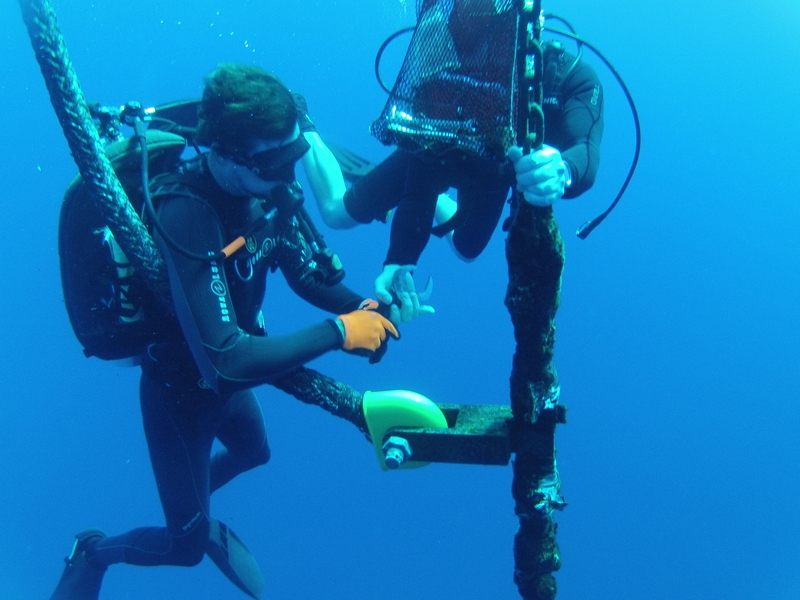 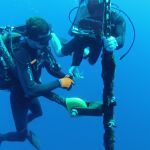 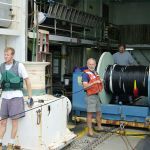 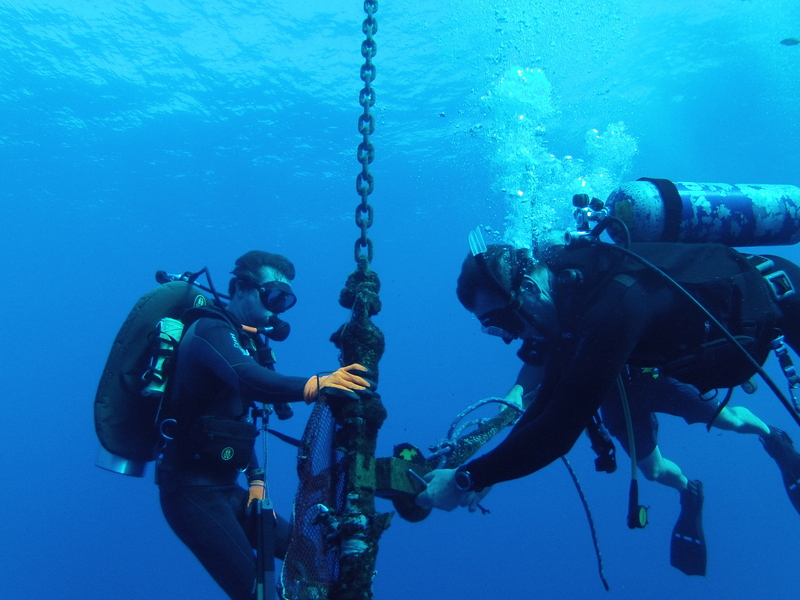 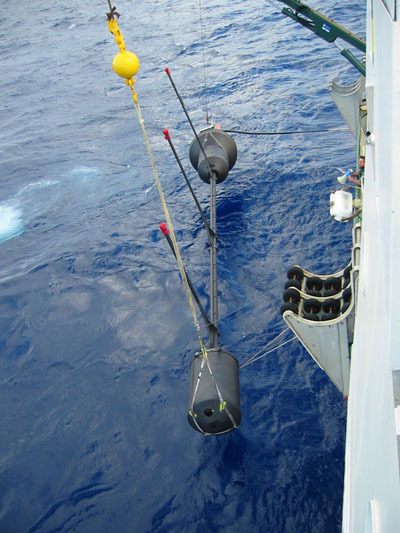 The deep sea mooring is deployed once every 2 years. 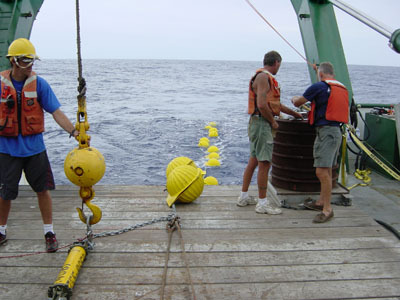 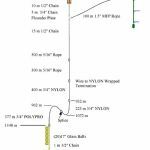 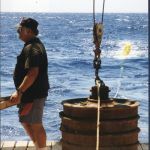 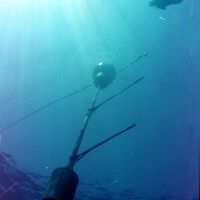 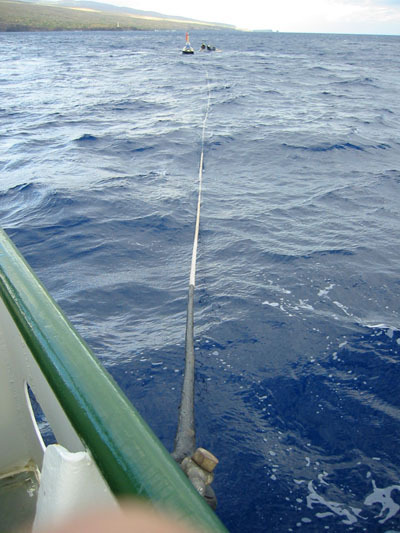 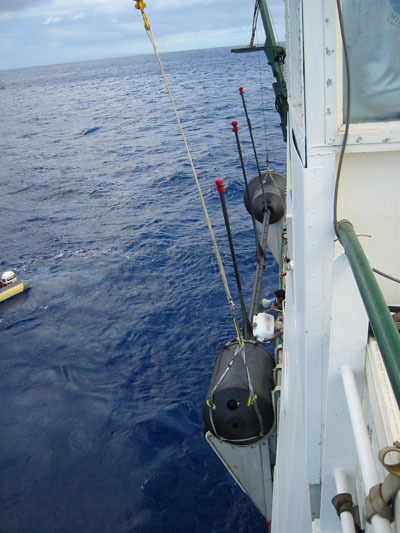 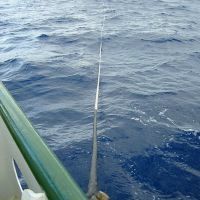 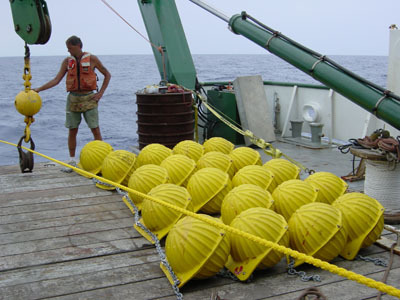 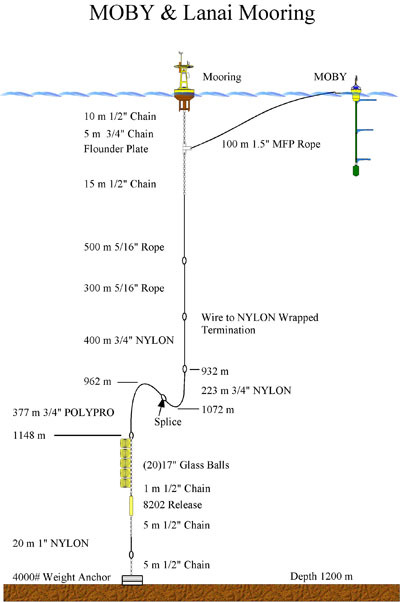 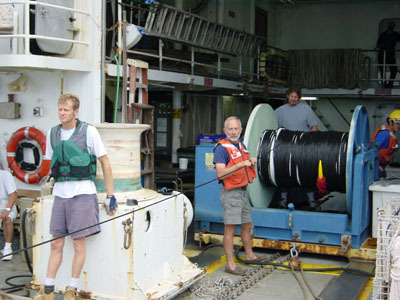 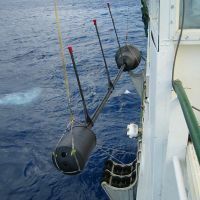 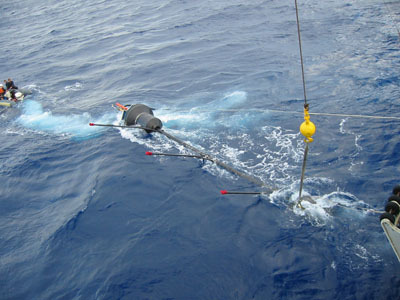 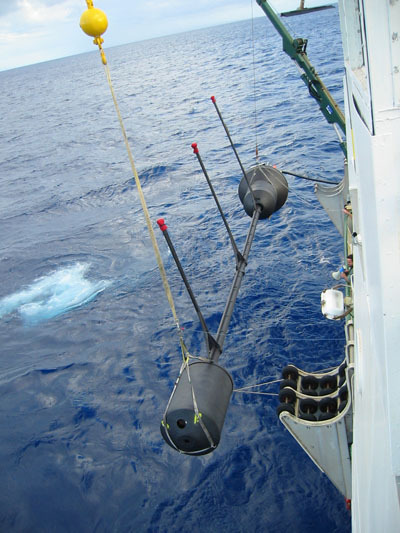 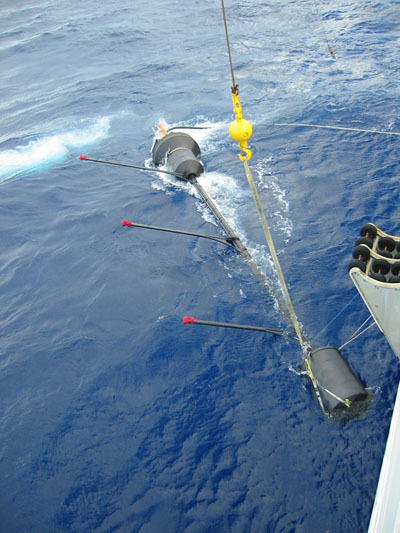 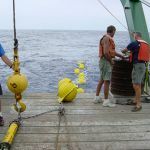 The mooring is used to tether the optical MOBY buoy and carries the meteorological sensors.